We were introduced to Spanish Tortillas when visiting Spain in June 2014. 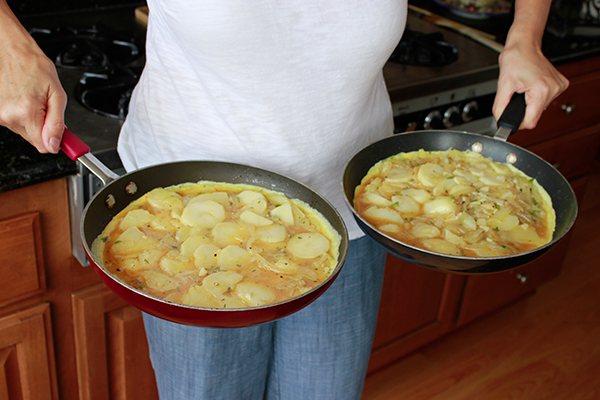 Potatoes and onions are cooked in olive oil then mixed with eggs and herbs to create a really spectacular omelet (Jane and Gus). I'll give you two methods here - one fries the potatoes and the other boils them. If you have potatoes left over from last night - use them! Add a couple of thinly sliced cloves of garlic about 5 minutes before the potatoes and onions have finished cooking. 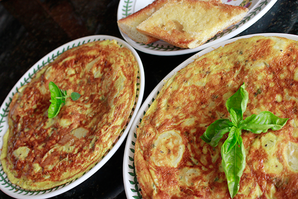 Serve for breakfast or with a green salad for dinner! And a nice bottle of Rioja of course! 1. Heat olive oil in pan. Add potatoes and onions - cook for around 20 minutes on medium heat until potatoes are cooked, turning frequently. You don't want to brown them. 2. 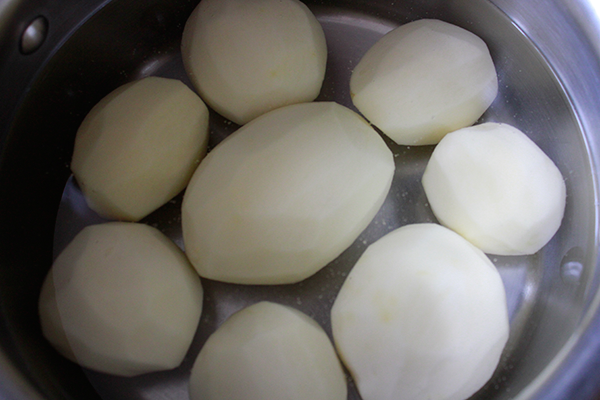 Remove potatoes and onions from pan - you might like to drain on kitchen paper. 3. 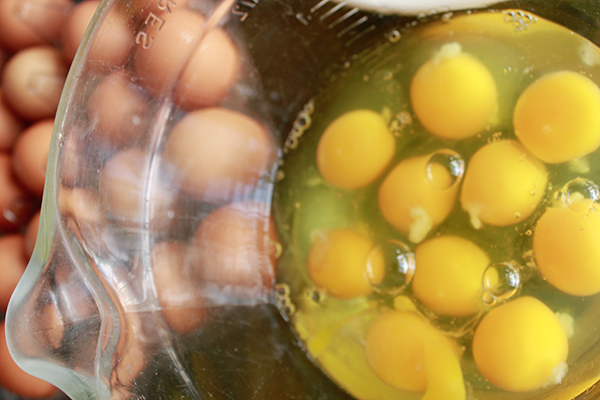 Mix eggs in bowl, add herbs, salt and pepper and then add cooked potatoes and onions. Mix gently to combine. 4. Pour mixture into 8" - 10" non stick pan - the pan you cooked the potatoes and onions mixture into will work. This will make enough for 2 tortilla. If you only have one pan, just use half the mixture. 5. Cook over medium heat for about 10 minutes. Now flip the tortilla - into another pan if you have one - or onto a large dinner plate, then slide back into the pan and cook for about a further 5 minutes. 1. 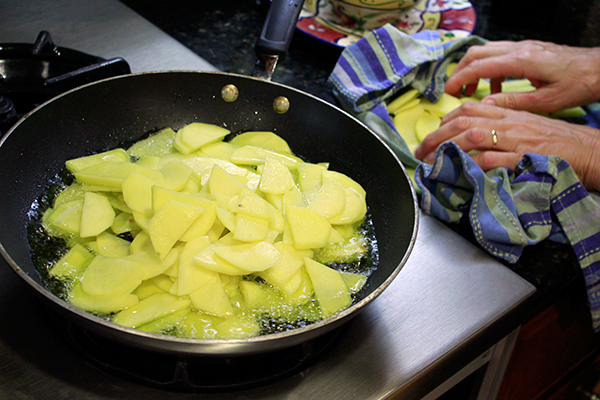 Don't slice potatoes - just cut in half and boil your potatoes - start with cold water - until tender. Cool by rinsing under cold water or waiting until cool to touch and then slice thinly. 2. Cook onions in 1 - 2 tablespoons of olive oil. Add sliced potatoes when onions are just about done. 3. Continue on as per step 3 of traditional method. No surprise here - the traditional method - cooked in lashings of olive oil - tastes better. There's something about potatoes and onions cooked to perfection in olive oil that makes the tortilla moist and surprisingly light. Tip: If you use the low calorie method - don't over cook the tortilla. 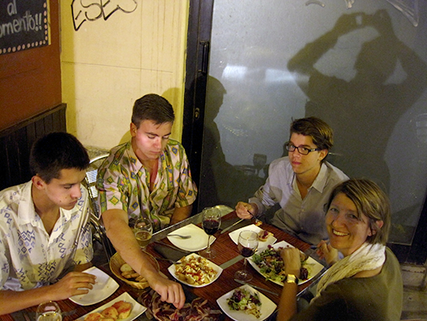 Tapas and Spanish Tortilla in Zaragoza 2014.